Many people are tricked into thinking that they would be able install their brand, new dishwasher themselves and save money on hiring a plumber. But in reality, dishwasher installation is always recommended to be installed by a licensed plumber. This process involves a lot of steps that should be handled by a professional plumber. Dishwasher installation requires strong knowledge of water and drainage pipes that need to be connected in a safe and proper manner. Also, keep in mind that this process involves electricity and water combination that can be extremely unsafe for an amateur to experiment with. Not only an incorrect installation can cause damage to your newly bought dishwasher, but it cans also cause flooding, electricity outage, and unsafe environment. As mentioned above, dishwasher installation is not an easy plumbing task to try on your own, especially with little or no plumbing skills. But, you will be surprised to learn that not even every plumber you come across is qualified to install a dishwasher, even though some will quickly take on this project disregarding the importance of professional skill requirements. It is always recommended to hire a certified plumber to do any plumbing job regardless of how complex or simple it might be. When choosing a plumber to do a job for you, consider these benefits of hiring a professional plumber. - A licensed plumber has proper training to comply with current safety rules and regulations, to avoid any harm, damage, or injuries. - A licensed plumber has updated knowledge of today's plumbing systems, and the proper tools and technologies to be used for guaranteed quality and functionality. - A licensed plumber has to have a certain amount of training hours to become certified, meaning that he already has experience and dealt with a similar problem before. 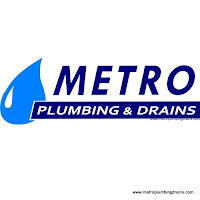 All plumbers at Metro Plumbing and Drains have the best training, knowledge and techniques to deal with any plumbing problem in a fast and professional manner. Our plumbers always arrive to our customers fully equipped and ready to resolve any plumbing damage and to eliminate the discomfort it is causing you as soon as possible. However, the quick resolution of your problem will not reflect the quality of our work! Dishwasher installation is one of the services all of our plumbers are experts in. Not only the job will be done in no time, but our team will go that extra step to guarantee the best quality service by simply inspecting your existing plumbing to ensure that the pipes are in good condition, before installing anything new. We guarantee excellent quality work!